After crossing the Andes through Paso Roballo, I join Chile’s route 7, the Carretera Austral or “southern road”, just north of the town of Cochrane and head south the 225 kilometers to Villa O’Higgins. Villa O’Higgins is just seven kilometers short of the southern end of the road which ends at Lake O’Higgins. The south end of the Carreterra Austral at Lake O’Higgins. The lake and town are named after Bernardo O’Higgins, a Chilean independence leader who helped free Chile from Spanish rule. The lake is located in one of the most inaccessible areas of the world, tucked between the Andes Mountains on the east and the Southern Ice Cap on the west. From Lake O’Higgins it is 780 miles north to the beginning of the southern road at Puerto Montt. The southern end of the Carretera Austral at Lake O’Higgins. 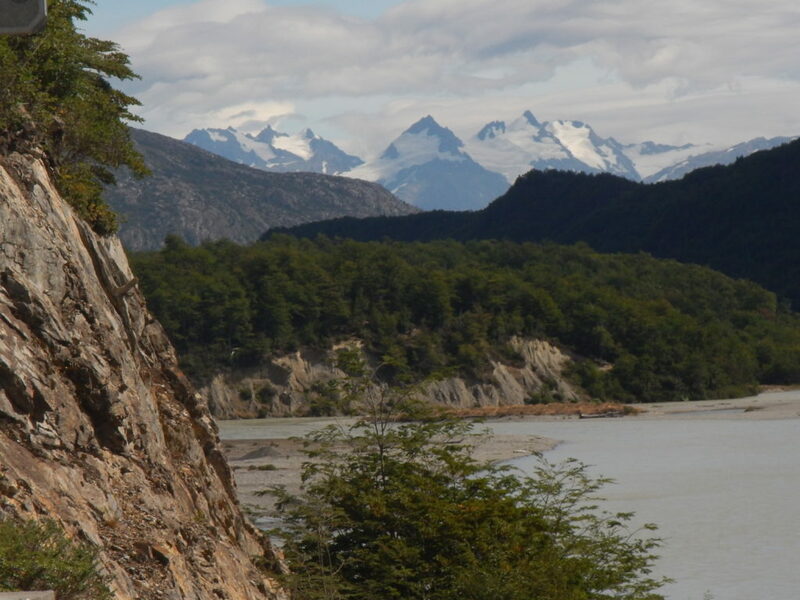 The Carretera Austral provides access to Chile’s southern territory an area characterized by thick forests, fjords, glaciers, canals, and steep mountains. The road is one of the most ambitious infrastructure projects ever undertaken by Chile. Construction began in 1976 under the dictatorship of Augusto Pinochet and the southernmost section to Villa O’Higgins was completed in the year 2000. The Carretera Austral or Southern Road begins in Puerto Montt in the north and ends 1247 km later at Lake O’Higgins. I arrive in Villa O’Higgins in the middle of February, which corresponds to our northern hemisphere’s middle of August. The weather has already turned toward fall with low temperatures at night in the thirties, fierce winds and frequent heavy rain with snow on the hills. It is reminiscent of the Dalton Highway in Alaska where snow in August is not uncommon. Ice is never far away. In Villa O’Higgins I camp at the Mosco Hostel and Campground. “El Mosco” camp is named after the Rio Mosco Glacier, so named because from the air the glacier resembles a fly or “mosco” in Spanish. The camp is run by a woman known worldwide for hosting bicyclists riding route 7. The hostel is clean, efficient and well run. Evening at the hostel is one big cook up with communal dinner being continuously prepared and plates of food being offered from all sides. I was glad there were a fair number of vegans cooking, but the barbecue smelled good too. 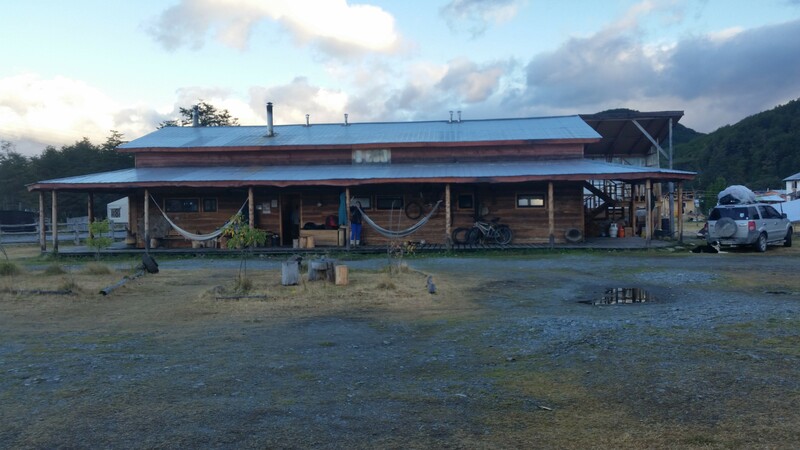 The friendly and well run Mosco Hostel in Villa O’Higgins. The camp was overflowing with backpackers and cyclist backed up and waiting to cross from Chile to Argentina. They had already been waiting for over a week because of bad weather and the prospects for the near future were not good. Many gave up and headed back north, the end of summer break was near and school would restart at the beginning of March. The southernmost crossing from mainland Chile to Argentina. A combination of two boats and a footpath that connects Lake O’Higgins in Chile and El Chalten in Argentina. The wind is blowing eighty kilometers per hour with gusts to one hundred and it is not safe for the boat that will take travellers across the lake on the first part of their journey. The crossing to Argentina is only for hikers or bicyclists and involves taking a boat two and a half hours across Lake O’Higgins to Candelario Mancilla still in Chile, then walking, horseback riding, or paying a four wheel drive vehicle to go twenty one kilometers to Lago del Desierto in Argentina. After a 30 minute boat ride across the Lago del Desierto it is then thirty seven kilometers by road to El Chalten, Argentina. One month prior on my southward journey down Argentina’s route 40, I camped at Lago del Desierto and spent several days in El Chalten. 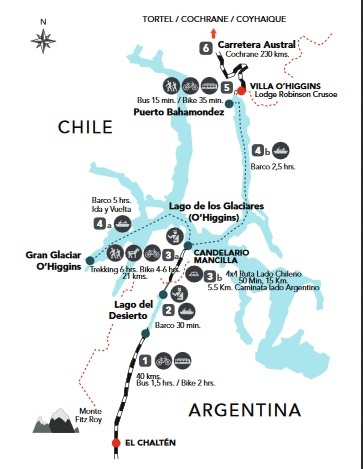 Villa O’Higgins is a tourist destination for access to the “Campo de Hielo Sur” or “Southern Patagonian Ice Field”. The Southern Patagonian Ice Field is the world’s second largest contiguous extra-polar ice field. It is the bigger of two remnant parts of the Patagonian Ice Sheet, which covered all of southern Chile during the last glacial period. The Southern Patagonia Ice Field extends for approximately 220 miles, and has an area of 4,773 square miles, of which roughly 3,700 square miles fall within Chile and 970 square miles within Argentina. The ice mass feeds dozens of glaciers in the area, among which are the Upsala , Viedma and Perito Moreno in the Los Glaciares National Park in Argentina. The Pío XI Glacier, the largest in area and longest in the southern hemisphere outside of Antarctica, the O’Higgins, Grey and Tyndall glaciers are located in Chile. 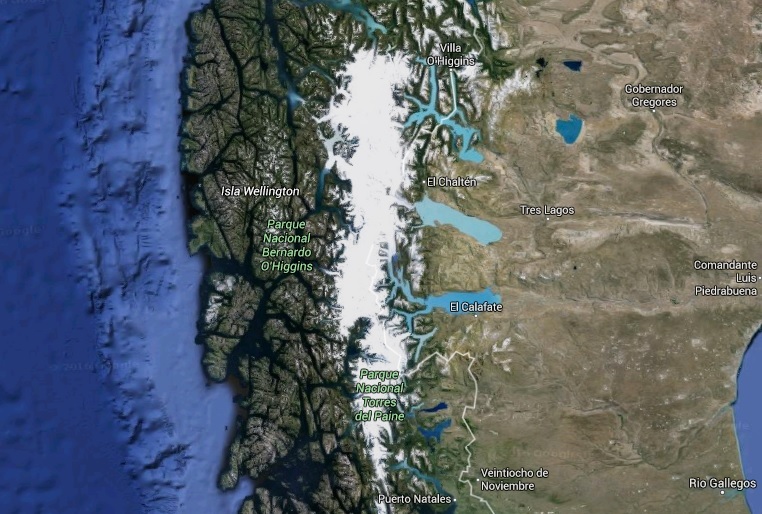 The glacier runoff going to the west flows into the Pacific Ocean; those going to the East flow into the Patagonian lakes Viedma and Argentino, and eventually, to the Atlantic Ocean. 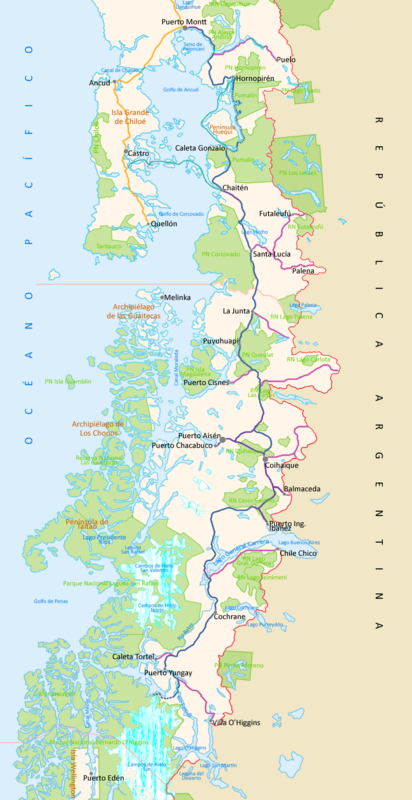 The fact that most of the ice lies within Chile but the useful runoff mostly benefits Argentina is a point of friction between the two countries. An important part of the ice field is protected under different national parks, such as the Bernardo O’Higgins and Torres del Paine in Chile, and the Los Glaciares in Argentina. There are two known volcanoes under the ice field; Lautaro and Viedma. Due to their inaccessibility they are among the least researched volcanoes in Chile and Argentina. 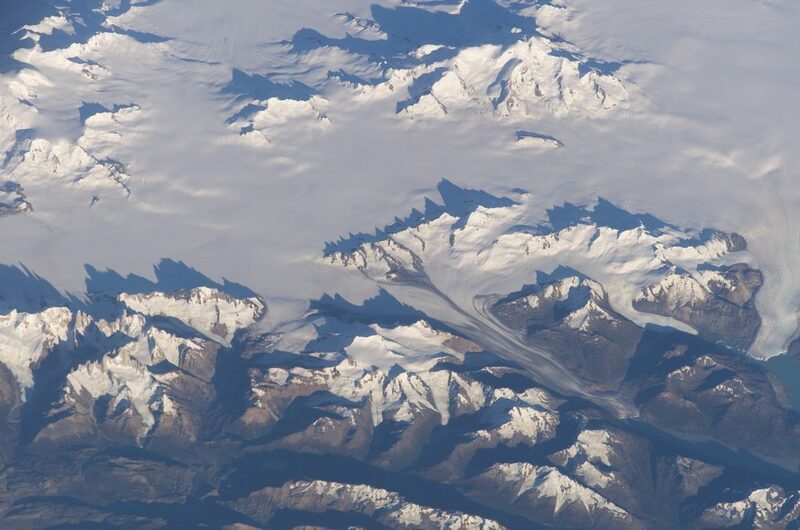 Aerial photo of part of the Southern Patagonian Ice Field. 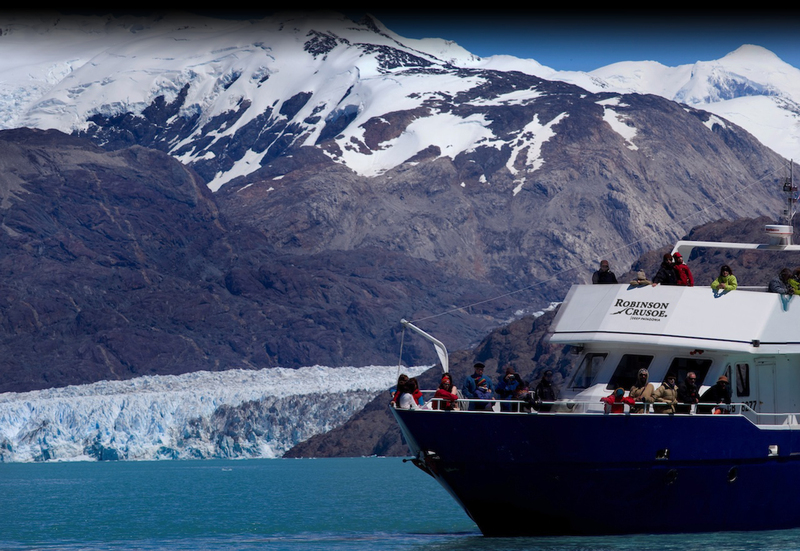 The vessel, the L/M Quetru, takes travellers across lake O’Higgins on the first leg of the pedestrian journey to Argentina and also takes tourists further up-lake to visit and view the Great O’Higgins Glacier. Glacier O’Higgins is one of the four largest glaciers in Patagonia. Its surface area is 820 square kilometers and it is 45 kilometers long. It terminates in Lake O’Higgins where it is 3.5 kilometers wide and its front wall towers 80 meters above the mirrored lake. The visit is akin to visiting the Perito Moreno glacier on the Argentine side in Glaciers National Park. Popular trip with adventure tourists is visiting the tip of the O’Higgins Glacier. 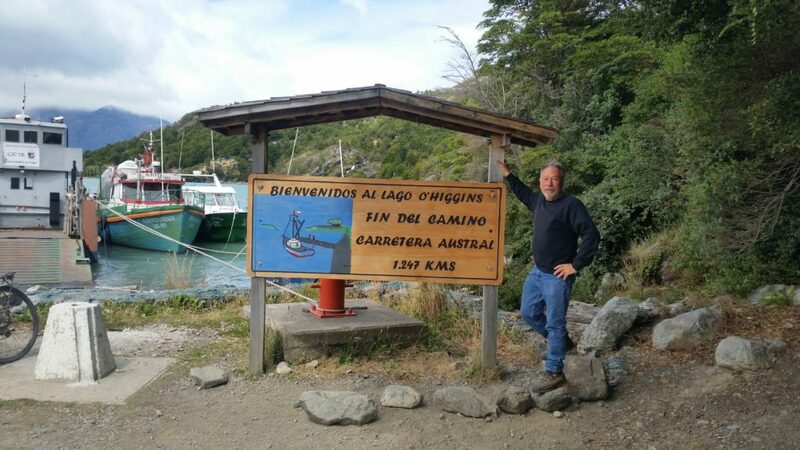 I depart Villa O’Higgins early to make the 62 mile three hour drive north to Rio Bravo where I will catch the first of two daily ferries crossing to Puerto Yungay. 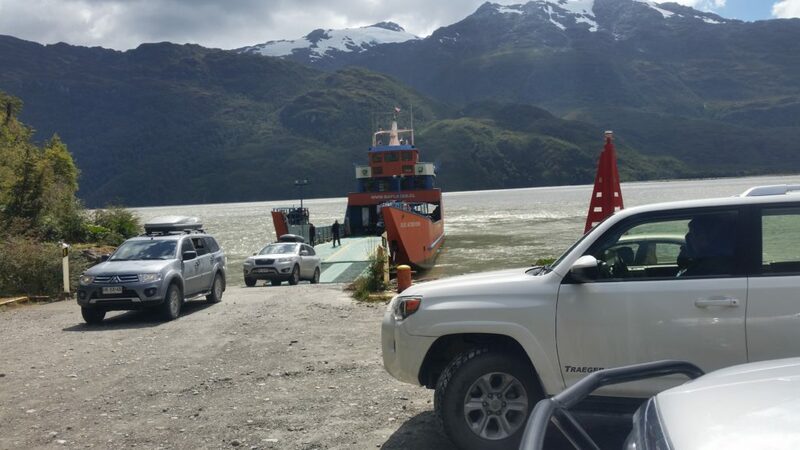 The ferry service is free and is part of the Carretera Austral. You back onto the Ferry and drive off forward at the destination. On the way north I come upon a car stopped on the road with all of its doors open. When the occupants pile back in I chat with them and learn that they had spotted a family of Huemules and they show me their great photos. The Huemule is a south Andean deer species and is endangered. There were only about 1500 known to exist in 2010. Both Argentina and Chile have joined in their conservation efforts and there are a lot of signs urging the public to watch out for them. 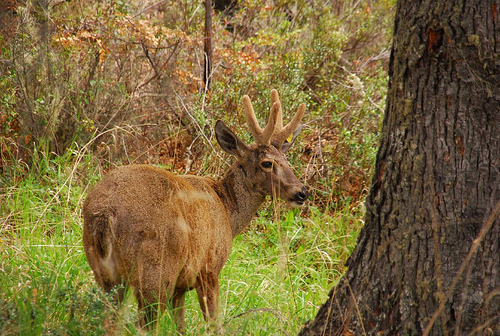 The Huemule a type of south Andean deer species is considered to be endangered and is protected. The drive through the unspoiled landscape surrounded by ice capped peaks and too many waterfalls to count is spectacular. The road is primitive but well maintained, the major concern is meeting oncoming traffic and hoping there is a place to pull over so two vehicles can pass. Traffic is not a major problem, except when the ferry arrives and discharges a dozen vehicles at once onto the road. 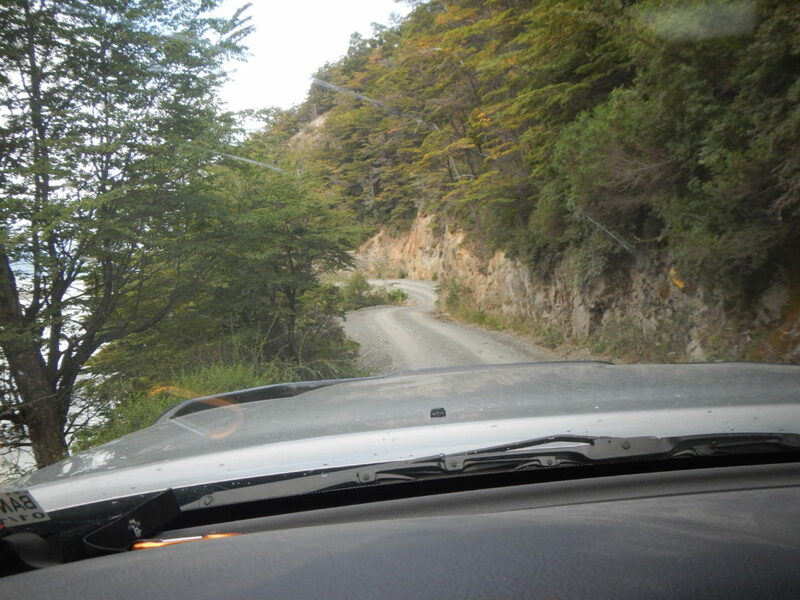 The narrow but well maintained Carretera Austral near its south end. I arrive at the ferry terminal and friends from Villa O’Higgins make me a vegan breakfast burrito, so I reciprocate and brew coffee and enjoy the wait. The ferry will discharge its load and then everyone will back onto the ferry in the order they arrived at the landing. 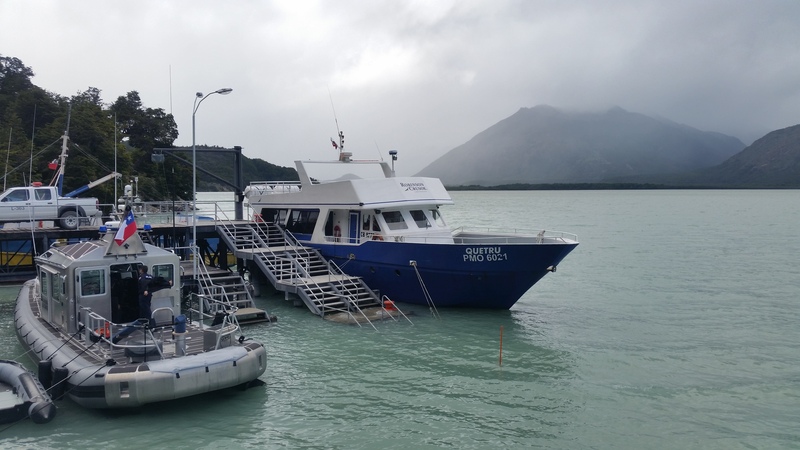 The crossing will take about 45 minutes to Puerto Yungay. Cars coming off the Ferry at Rio Bravo 62 miles north of Lake O’Higgins.